Written by: KristaG on October 9, 2018. 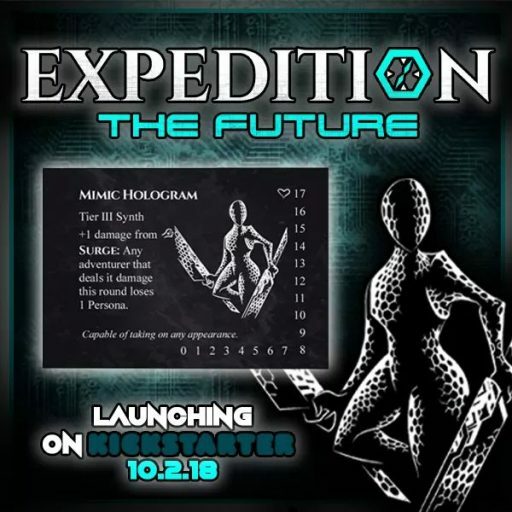 Expedition The Future is now live on Kickstarter! It features a sci-fi theme! Before my Player 2 backed Expedition’s “The Horror” on Kickstarter back in September of 2017, I hadn’t had much experience with the “RPG in a box” style of board gaming. Along with the expansion, he picked up a copy of the base game and had us both download the app. Once the game arrived and we played through a few missions, we were hooked. Now, just over a year later, Fabricate.IO is launching a new campaign for the next set of cards in the series: “The Future.” Each set has a very different and distinct theme, yet they can all still be played together. The original base game has a strong fantasy theme, “The Horror” expansion is more H.P. Lovecraft inspired, and “The Future” sets the game in a Science Fiction theme. 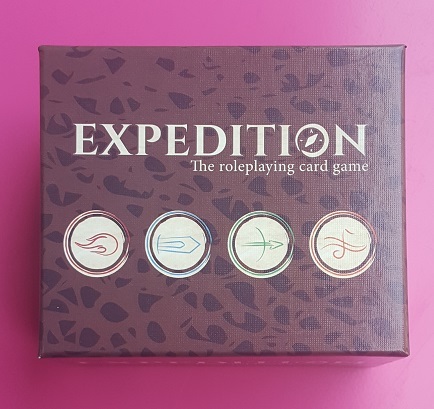 Expedition is a light RPG (or role-playing game) where each adventurer chooses a role to play (actual roleplaying is optional, but highly encouraged) and chooses an adventure from the many included with the free downloadable app to run themselves through. The base game for Expedition! Expedition itself is playable for 1-6 adventurers and was designed by Scott Martin and Todd Medema. 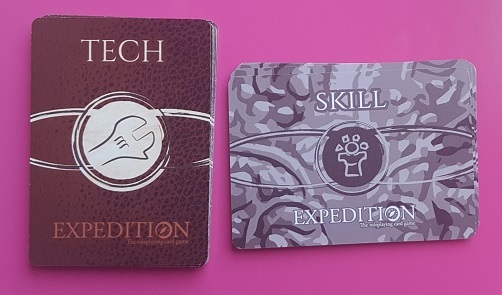 Though the game is and always has been available as a free print and play from the Expedition website, the game was actually brought to print thanks to an April 2016 Kickstarter campaign. The app comes with several basic missions to learn from and play through. However, there are also more adventures being uploaded frequently by other users in the community – especially as more expansions are added! Due to the app, a GM/DM is not needed so everyone is actually able to play in the adventure. The new expansion adds Tech Abilities and Skill cards as new mechanics! As with the addition of “The Horror,” Expedition’s newest expansion adds new depth and mechanics to the game. Adventurers now gain actual skills to aid them in their quests as well as adding Tech to a character’s possible abilities. The expansion also adds new character roles to play, monsters to fight, and even more loot to earn! Surprisingly, this doesn’t change set up all that much but does give players more options for actual character building. All of these inclusions sum up to be an entirely new experience. I personally feel these additions do make the game a bit more difficult but in a good way. This is, of course, dependent upon the adventures that people contribute and how they choose to incorporate the new mechanics. Alongside this new expansion, the current Kickstarter campaign includes a deluxe version of the game that features heavier cards, a larger box, deluxe clips, and all new artwork. Since receiving a prototype of “The Future,” I have played several games of the tutorial. Some we have won and some we definitely did not even come close! Each game, however, has been drastically different even though we were going on the same adventure. I really like the skills checks and that I am able to have a little more choice and freedom in how I build and level up my character. Out of the 4 new characters, I think “The Disgraced Scientist” is my favorite to role play as. For anyone who enjoys choose your adventure stories, wants to get into role-playing games, or is tired of always being asked to be the DM for game night, I highly recommend picking up a copy of The Expedition. Adventures tend to run very quickly and many of them are family friendly. With its compact size, I was even able to take it on a plane with me to take home to introduce the game to my family and friends back in Virginia. The campaign ends the week of Halloween, so act now before you miss your chance!